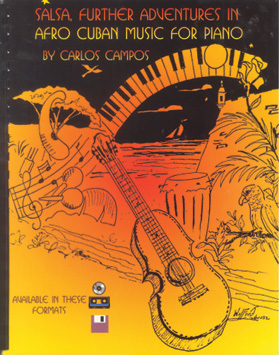 A follow-up to Campos’s previous work, the highly successful Salsa And Afro Cuban Montunos For Piano, this book was inspired by the questions asked from many of his students attending his salsa piano class at the Berklee School Of Music and also in his private teaching practice in Los Angeles. One recurring challenges for the salsa piano student is to learn to feel this type of music and to be able to develop the very strong sense of inner pulse needed to be able to experience flow while playing the montunos. Rhythmic exercises at the beginning of this book help to develop this inner pulse. By popular request there are four fully transcribed pieces. The accompanying CD enables the student or musician to hear the full band arrangement as well as playing along with the full band, with the use of different mixes. Includes transcriptions of different percussion patterns to show how they all work together to create that ultra tight salsa ensemble sound, and a section covering many of the commonly used percussion patterns with the accompanying audio. The many montuno patterns in the first part of the book are written in both 2/3 and 3/2 clave with almost every example written in montuno style (for ensemble playing) and in montuno/tumbao style (for solo playing).